Author of "The Spider Kiss." 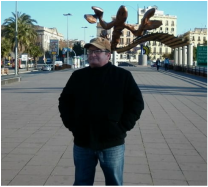 David Turnbull is a member of the Clockhouse London group of genre writers. His short fiction has been published in a number of anthologies, including ‘Beware the Little White Rabbit’ Leap Books and ‘We Can Improve You’ Boo Books and more recently ‘Creeping Crawlers’ Shadow Publishing and ‘Frozen Fairy Tales’ World Weaver Press.